184 pages | 17 B/W Illus. Assessing and managing risk is vitally important, and is increasingly studied in a range of areas including politics and international relations, finance and insurance, and innovation and the valuing of intangible assets such as patents and intellectual property. The degree to which innovation is encouraged or otherwise – a key factor for many businesses - depends in part on the attitude towards risk in the context in which it takes place. 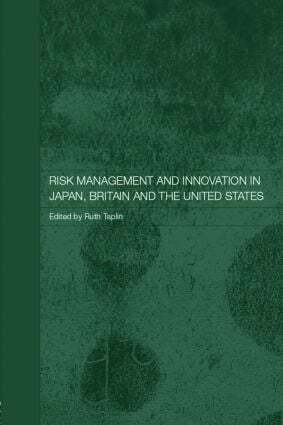 Taplin considers the different attitudes towards risk and innovation, and the different ways in which risk and innovation are handled, in Japan, Britain the USA. Providing a broad and detailed examination of the subject, she discusses topics including risk management standards, managing risk in marketing, the insurance industry, patents, and in venture capital, and of how risk management in organizations has evolved. Ruth Taplin is Director of the Centre for Japanese and East Asian Studies which won Exporter of the Year in Partnership in Trading/Pathfinder for the UK in the year 2000. She received her doctorate from the London School of Economics and is the author/editor of 11 books and numerous articles. She published Valuing Intellectual Property in Japan, Britain and the United States with RoutledgeCurzon in 2004 and is currently preparing Japanese Telecommunications Market and Policy in Transition for publication by Routledge. Professor Taplin has been Editor of the Journal of Interdisciplinary Economics for ten years. Currently she is a Research Fellow at Birkbeck College, University of London and the University of Leicester. She was recently appointed Visiting Professor at the School of International Business and Management, University of Warsaw, Poland. The aim of this series is to publish original, high-quality work by both new and established scholars on all aspects of the growth economies of Asia.